Slip and slide through a variety of locations around the world. 3D aspect isn't as well done as it should be. Snow Moto Racing 3D is a passably fun trip to the snowmobile racing circuit. You’ll be slipping and sliding through the turns, performing back flips and tsunamis as you fly through the air, and if luck holds – a spot on the podium at the end of the race. Unfortunately, the 3D aspect isn’t as well executed as it could have been, making it a game best played in 2D. Zordix brings another entry to the 3D racing field with Snow Moto Racing 3D. 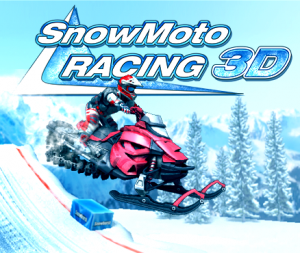 Following closely after the release of Aqua Moto Racing 3D, both are very similar in makeup and execution, offering a bite sized racing experience that is great for gaming on the go. 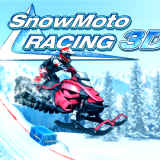 Snow Moto Racing 3D is pretty much exactly what it sounds like. 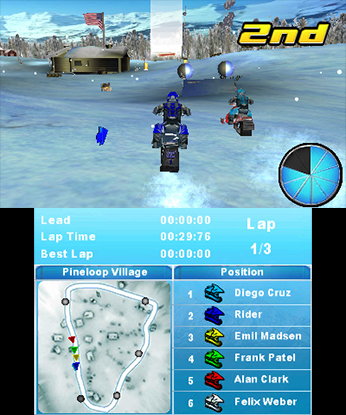 You’ll be racing through a snowy track amongst a field of other snowmobiles, fighting tooth and nail for the coveted first place. The controls are pretty simple to pick up on, basic as they are. A or Y accelerates; B is the brake; and X launches turbo boost. The shoulder buttons each hold a list of tricks that can be performed in-race for extra turbo and cash. It’s really as simple as that, relying on your skill with the circle pad to keep your ride on the track. Keeping it on the track is actually exceedingly difficult to do. It is a snow track, so that’s somewhat to be expected, but it feels a bit excessive at times as you slip and slide around pretty constantly. Going off the track doesn’t penalize you per se, but it does slow you down significantly, which is always a negative when racing. As long as you hit the checkpoints, you have a lot of leeway in how you navigate the tracks, even to the point of taking shortcuts on corners, but it’s a weighing game, where you’ll have to carefully gauge whether the slowdown that accompanies the shortcut makes it worthwhile. You have three options for play – Quick Race and Multiplayer, which are just what they sound like, and Championship. Championship mode offers you a trip through the racing circuit, from the Beginners Cup to the Pro Cup, three races at a time. You’ll have to unlock the first cup before you can move along to the next, so you’ll likely be repeating some of the races to get the coveted top spots – the races themselves are quite short, though, so it isn’t all that troublesome. You can pick up cash while you race, in the form of money bags and treasure chests that are spread around each of the tracks. You can also perform stunts to earn money rewards, and of course a top finish will also line your pockets. You can take your cash straight to the garage to purchase upgrades to enhance your racing experience. The races themselves are a pretty standard three lap course, with checkpoints spread throughout. 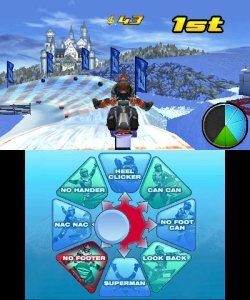 The tracks are in a variety of interesting locations through Europe, Asia, and America, including iconic spots such as Yellowstone, The French Alps, and Tibet. While the 3D aspect of the game is a real draw, particularly given the renowned beauty of the locations, it will likely end up disappointing you in its execution. Alas, this is a game better played in 2D, as the 3D will noticeably slow you down.